As a perennial plant, it can be sown outdoors all year round in milder climates or given some protection in colder areas. Growing around 20cm (8in) tall it can also be grown in containers. Use as a baby leaf in salad mixes, it will “Cut and come again” two to three times. For restaurant quality micro-greens or pesto, use wild rocket when only the finest ingredients will do. Hot rocket arrived in the UK from Italy a couple of decades ago. Now the leaf that adds zing to green salads is ubiquitous. But the type you find in ready-picked salad bags is not always as peppery-hot as it should be. Because of increasing demand, plant breeders and seed companies now produce many variations on the cultivated types of rocket. 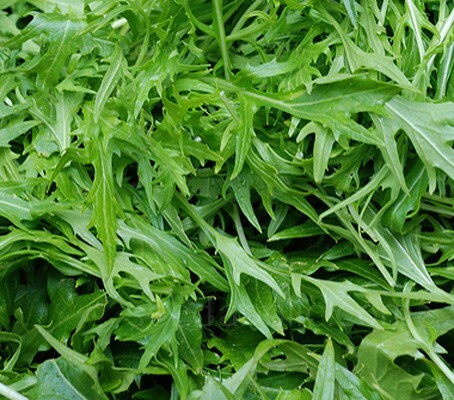 Large-leaf salad rocket is higher-yielding but also has a milder flavour. Wild rocket is thinner, darker and hotter. Sow directly into a bed containing any good fertile, well drained soil. Use a line to mark out the row. Sowing in a straight line allows you to identify where your rocket seedlings are and which are the weed seedlings to pick out. Sow just a small quantity at one time, and then sow successionally, to harvest over a longer period. A 1m (3ft) row is usually enough to get you started. Late summer sowings will carry on cropping into the winter if the plants are protected by cloches. Sow direct in spring for summer greens, and in autumn for winter greens. Sow thinly 6mm (¼in) deep in drills spaced 45 to 60cm (18 to 24in) apart. Sow the seeds thinly along the row, spacing them out as evenly as possible. The distance between the seeds should be about 3cm. (1¼in) Cover the seed lightly with soil. Remove any weed remnants or large stones as you go to ensure the plants have a good start. Water the seeds in well using a watering can with the rose attached. This means you drench the soil but minimise disturbance to the seeds. Flea beetle can be a problem in summer, nibbling holes in rocket leaves. The best defence is to cover the row with a length of horticultural fleece. Rocket will always want to flower in summer, because this is the time of year when all crucifers naturally flower, then produce seed. As autumn approaches, cover crops with sheets of horticultural fleece to keep the cold at bay, and you could be cropping right through to first frosts. Simply pick the young leaves and the plant will keep generating new ones for months. Older leaves are a bit tougher and hotter. Pick over the whole row rather than just one or two plants as this would weaken them. As the flower buds appear pinch them out to prolong cropping. The flowers are small, yellow with dark centers and can be used in the salad for a light piquant flavour. Rinse the leaves in cool water and dry on paper towelling. Wrap leaves tightly in plastic or a zip lock bag. Best if used within two days. Arugula is a nutritional powerhouse, containing significant folate (folic acid) and calcium. Exceptionally high in beta carotene, vitamin C, and a good source of iron, Arugula is a member of the same family as cabbage and broccoli and like all such vegetables; it contains cancer-fighting phytochemicals called indoles. You can substitute water cress for a similar peppery flavor. You can also use fresh baby spinach (but the flavour will not be the same). Also dandelion greens have a tart flavour but a bit more bitter. The genus Diplotaxis is from the Greek diplous, meaning ‘double’, and taxis meaning ‘row’, because of the double row of seeds in the seed pod. The species name tenuifolia means ‘with finely-divided, slender leaves’. Eruca is a classical Latin name used by Pliny. The term arugula (variations of Italian dialects around Arigola) is used by the Italian diaspora in Australia and North America and from there picked up as a loan word to a varying degree in American and Australian English, particularly in culinary usage. The names ultimately all derive from the Latin word eruca. Vernacular names include Garden Rocket, Rocket, Eruca, Rocket salad, or Arugula (American English), In Italy, it can be known as Rucola, Rugola, Rucola gentile, Rughetta, Ruchetta or Rucola selvatica. In Roman times Arugula was grown for both its leaves and the seed. The seed was used for flavouring oils. Part of a typical Roman meal was to offer a salad of greens, frequently arugula, romaine, chicory, mallow and lavender and seasoned with a 'cheese sauce for lettuce'. It has been used in England in salads since Elizabethan times. On another interesting note, Rocket or Arugula seed has been used as an ingredient in aphrodisiac concoctions dating back to the first century, AD. (Cambridge World History of Food) - …but we can make no promises!